Catholics living in the area around Kouts were first served by Father Joseph Andrew Stephan, who initially said Mass at the log house of Anthony Dyszkiewicz. Father Stephan was born November 22, 1822 in Gissigheim, Germany, then a village in the Grand Duchy of Baden. As a young man Stephan was employed as a carpenter, later entering the military and serving as a officer. After military service, Stephan took up the study of civil engineering and philology in Germany. It is reported that while studying philology that Joseph Stephan, for an unknown reason, became blind. Turning to God for guidance, he pledged that if his eyesight were returned that he would serve the church and become a priest. Within two years, Joseph's eyesight miraculously returned. Thus, his life changed dramatically as he began studies for the priesthood. In 1847, while Joseph was completing his studies at the University of Freiburg, he was made aware that his father, who had emigrated to the United States, was severely ill. Joseph immediately left Germany for the United States in May 1847 and was able to be with his father before he passed away. Joseph Stephan did not return to Germany, however. Instead, he took up his theological studies for the priesthood at the seminary of the Diocese of Cincinnati in Ohio, being ordained on March 19, 1850. Upon becoming a priest, Father Stephan was assigned to serve parishes located in Ohio and Indiana, including those Catholics living in the vicinity of Kouts in Porter County, Indiana. Father Stephan's primary assignment among his parishes was to build his congregations, both spiritually and physically. One biography of Father Stephan states that he had a "wide range of skills in building up new regions....he was well educated, a trained engineer, a musician, and a cook. He was an inspirational speaker, a bundle of energy, and a strong administrator, which were necessary in building, and some cases, rebuilding, parishes." In 1856, Father Stephan was assigned to serving Catholics in northern Indiana, with the Catholic Diocese of Fort Wayne being created by Pope Pius IX in 1857. By this time, the Pottawatomie Indians had been removed from the the northwestern portion on Indiana, opening considerable acreage for settlement. A large number of Germans from both Pennsylvania and Germany began to establish homestead claims in the region. Noticing the significant migration of Germans to northern Indiana, Father Stephan made an effort in 1858 to develop a Catholic colonization of the area; he purchased thousands of acres of land in Jasper County in and around Rensselaer and then resold the land to German settlers. Assisting settlers in acquiring proper legal title to their homestead, Father Stephan also established missions in Kentland, Remington, and San Pierre. It is believed that Father Stephan served the Kouts Catholics while performing services around the San Pierre area. One biographer writes some parishioners believed that Father Stephan was "rather odd because he occasionally wore blue suits or clothing thought inappropriate for a Catholic clergyman. Even worse, Stephan occasionally missed Sunday mass. He was an enthusiastic hunter, and several times he strayed too far to return to say mass!" 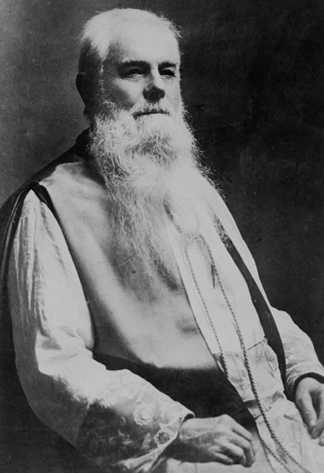 Photograph of Reverend Monsignor Joseph Andrew Stephan. Stephan served as the first paster of the Kouts area Catholic congregation. Source: Bureau of Catholic Indian Missions, Black and Indian Mission Office. During the Civil War, Father Stephan was commissioned a Chaplain in the 47th Regiment of the Indiana Volunteer Infantry. He not only performed his duty as a spiritual guide to the troops he served, but also used his engineering skills to design and construct a pontoon bridge. Apparently his pontoon bridge was well designed, as his superiors encouraged him to make a career of military service. He declined, however, and returned to serving his flock in Northwest Indiana. Upon his return to Indiana, Father Stephan became increasingly interested in the welfare of Native Americans and turned his efforts toward this singular cause for the remainder of his life. He soon left Indiana to serve Native American missions in South Dakota. He later became the Director of the Bureau of Catholic Indian Missions, serving in this capacity from 1884 to 1901. From 1864 to 1883, the Catholics of the Kouts area were served by Father Michael O'Reilly from Valparaiso. 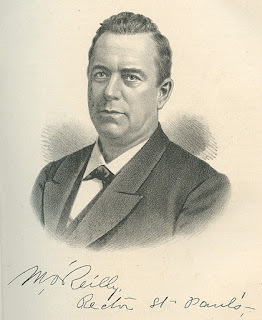 O'Reilly initially held Mass in Kouts once every two months from 1864 to 1883, and then from 1884 to May 1887 he would hold Mass every month. Most Catholics in the area were poor, so a church was not constructed and Mass was held in the houses of the local parishioners. also served the Catholic congregation of Kouts from 1864 to 1883. Father O'Reilly initiated the process to construct a church in Kouts. The seeds for the construction of St. Mary's Catholic Church were planted in 1883 at a meeting of local Catholics that raised about $700. A picnic to raise funds for the construction of the church was held also on July 24, 1884. Father O'Reilly then purchased the church lots (Lots 3 and 4 in Block 2 of the Wright's Addition) from Hillary A. Wright in September 1885. 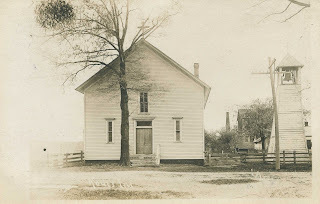 The church was then constructed so that the building could easily be converted into a parochial school house should the congregation grow to significant size. Charter families of St. Mary's Catholic Church included: Baranowski, Barry, Best, Burke, Callahan, Casey, Cincoski, Czyzewski, Deegan, Diskavish, Drazer, Kneifel, Lauer, Lukoski, McCarthy, McGrath, McNeff, McGrath, Mishnich, O'Brien, Quirk, Radilyack, Ryan, Schoepp, Shutske, Smith, Tromblee, and Welsh. From 1887 to 1890 the parish was served by Father Kobylinski from North Judson, and then Father Frericks served for the next two years. Frericks was succeeded by Father Dominic Shunk of Wanatah, who served the parish for two years. 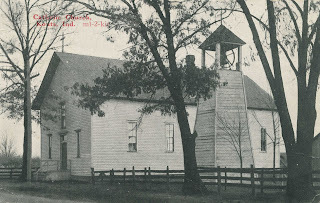 During Father Shunk's leadership, the belfry constructed beside the church was erected. A bell, weighing a thousand pounds and costing $257, was purchased on August 26, 1893, and installed in the belfry. Postcard of St. Mary's Catholic Church, circa 1908. 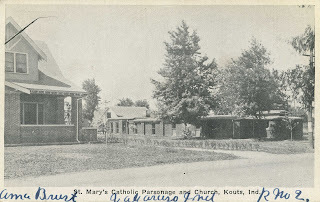 Postcard of St. Mary's Catholic Church, circa 1910. Following Shunk as pastor were Father Charles Thiele (four years), Father Gregory Zern (three years), Father Joseph Bilstein (13 years), and Father Bruno Soengen (8 years). It was during Father Soengen's service to the Kouts Catholic community that disaster struck. On May 26, 1917, a tornado completely leveled St. Mary's Catholic Church; services for the next year were held in the Kouts High School. completing demolished by a tornado on May 26, 1917.
months in 1917 until a new church structure was being constructed. Soon after the disaster, a committee was formed to prepare for building a new church. The plan was to accumulate enough funds to build a basement structure that would be used for Mass and then build a fund to construct the church over the basement level. William Wiley, of Chicago, received the contract for both design and construction of the new church. Ed O'Brien and Thomas Britton were appointed by the congregation to serve as supervisors as construction took place. By the fall of 1917, the construction of the basement portion of the building was taking place, and was available for use on April 21, 1918. The total cost for this segment of the construction was $7,000. A rectory was constructed next to the new church basement; this building was completed in November 1921 when Father Joseph Soelzer was pastor of the Kouts congregation. 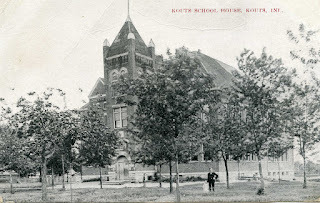 By February 1926, plans were in place to erect the superstructure of St. Mary's over the already completed basement. Built within eight months, the newly completed St. Mary's Catholic Church was dedicated by the Bishop of Fort Wayne, John F. Noll, on October 31, 1926. the total cost of the 1926 construction phase was about $25,000, which was funded with parishioner's contributions and a mortgage. The mortgage was retired with a celebration 22 years later on December 19, 1948. 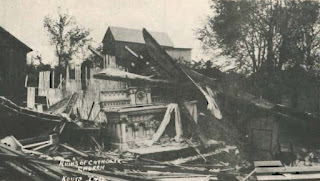 Disaster nearly struck the congregation twice when another tornado hit Kouts on May 28, 1935. 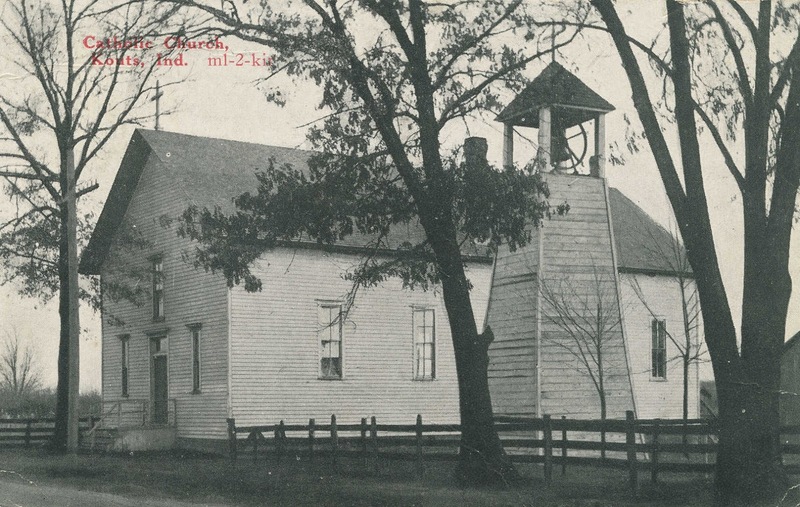 This tornado, however, only inflicted slight damage to the church when a tree fell upon the west side of the building resulting in some repairs. Bureau of Catholic Indian Missions, Black and Indian Mission Office, Washington D.C. (http://blackandindianmission.org/about-us/bcim/). Accessed November 5, 2015. Centennial Committee. 1965. 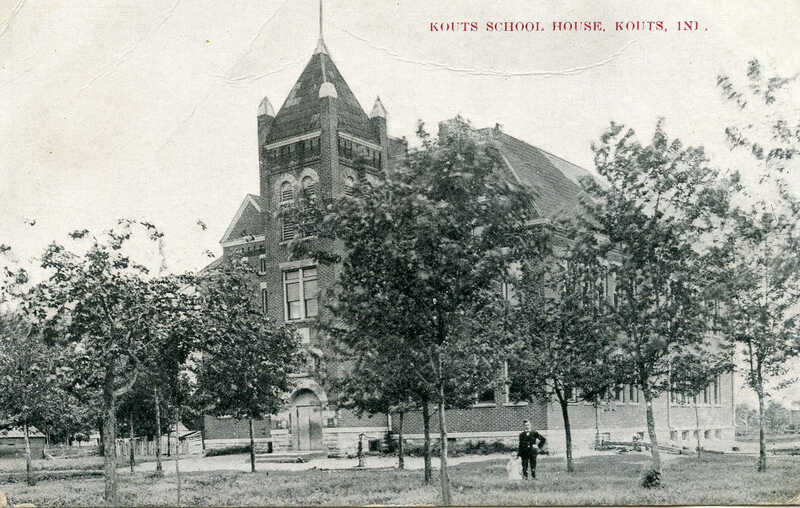 Kouts Centennial, 1865-1965. Kouts, Indiana: Centennial Committee. 181 p.
Goodspeed, Weston A., and Charles Blanchard. 1882. Counties of Lake and Porter, Indiana: Historical and Biographical. Chicago, Illinois: F.A. Battey and Company. 771 p.
Prucha, Francis Paul. 1979. The Churches and the Indian Schools, 1888-1912. Lincoln Nebraska: University of Nebraska Press. 278 p.
Prosen, Anthony J. 1976. Joseph Andrew Stephan: Indiana's Fighting Priest. Social Justice Review 69:150.